Are you the owner of a brick-and-mortar Lakeland FL resume service that's not listed here? Want to be? Just contact us and let us know! 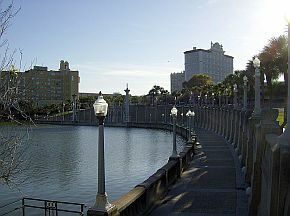 Situated halfway between Tampa and Orlando and almost dead center in the middle of the Florida peninsula, the city of Lakeland has served as an important link between the two coasts and the Panhandle area of the state. Appropriately named - there are 38 lakes within the city limits – the city’s residents often use these natural features as landmarks instead of their street addresses. Recreational activities also center on the lakes although the current, American League champions, the Detroit Tigers, play their spring training games in the city. The local economy is based mostly on ranching, farming and mining with some retail. The usual citrus fruits are grown and fully one quarter of the U.S. phosphate production is mined in Lakeland. In addition, the city is headquarters to the regional grocery chain, Publix and is a transportation hub for Fed Ex. Lakeland is home to significant populations of native Spanish and German speakers. Is also has widely diverse religious populations and boasts a synagogue, mosque and Hindu temple. In addition, it is blessed with a low cost of living, very affordable housing and an extremely business-friendly local government.